Rule No. 1: Buy calls when the overall market is down; buy puts when the overall market is up. By and large, when the stock market rallies, most stocks rally, and when the stock market decline, most stocks perform likewise. The extent of this movement can easily be measured by observing stock indices. We recommend using the advance/decline index as a proxy for the overall market. However, if this is unavailable, one could also use the net price change of a comprehensive market average, such as the Standard and Poor's 500, New York Stock Exchange Composite, NASDAQ, or Dow Jones Average. For the overall market to rally, the majority of individual stocks must rally too. Sure there are days in which the market is rallying even though the number of advancing issues is less than the declining issues but this cannot last long if the stock market is to mount a sustainable advance. Similarly, on the downside, the market cannot undergo an extended decline unless the number of declining stocks outnumber the advancing stocks. When the overall market trades lower, call option premiums typically decrease. Therefore, by requiring the market index to be down for the day at the time a call is purchased, the prospects for a decline in a call's premium are enhanced. Similarly, when the overall market trades higher, put option premiums typically decrease. Therefore, by requiring the advance/decline market index to be up for the day at the time a put is purchased, the prospects for a decline in a put's premium are enhanced similarly. Since most stocks rise and fall with the general market – with the possible exception of gold stocks – this provides a measure of much-needed discipline and helps prevent emotional, uncontrolled option buying. Rule No 2: Buy calls when the industry group is down; buy puts when the industry group is up. Just as most stocks move in phase with the market, most industry group components move in sync with their counterparts within their specific industry as well. Therefore, when one stock within an industry group is down, chances are the others are down as well. It's the exception when one component of an industry advances while all the other members decline, or vice versa, especially over an extended period of time. For example, situations can arise where a buyout occurs and the accumulation of one company's stock causes it to out-perform the others within the industry group. However, announcements such as these typically cause the other stocks within the same industry group to participate in the movement since the market's perception is that all companies within the group are likely acquisition candidates and their stocks are "in play," so to speak. Rule No 3: Buy calls when the underlying security is down; buy puts when the underlying security is up. In order to time the purchase of calls, we look for the price of the underlying security to be down relative to the previous trading day's close. If the stock's current market price is less than the previous day's close, most traders extrapolate that the downtrend will continue. It is also possible to relate the stock's current price with its opening price level to make this rule more stringent. Either relationship, that is, current price versus yesterday's close or current price versus the current day's open, can be applied or a combination of the two can be used to insure that the composite outlook for the market is perceived bearish by most traders. In order to time the purchase of puts, we look for the price of the underlying security to be up relative to the previous trading day's close. If the stock's current market price is greater than the previous day's close, most traders extrapolate that the up trend will continue. It is also possible to relate the stock's current price with its opening price level to make the rule more stringent. Either relationship, that is, current price versus yesterday's close or current price versus the current day's open, can be applied or a combination of the two can be used to insure that the composite outlook for the market is perceived bullish by most traders. Rule No. 4: Buy calls when the option is down; buy puts when the option is down. Just as the previous series of rules required that specific relationships be fulfilled, so too must this prerequisite be met. In fact, of all rules listed, this requirement is singularly the most important. 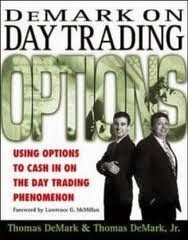 The option's price, be it a call or a put, must be less than the previous day's close. As an additional requirement, it may also be less than the current day's opening price level as well. Obviously, if an option's price is inevitably going to rally, it is smarter to buy as low as possible. Further, if the call or the put unexpectedly continues to decline to zero, then the loss incurred is nevertheless less than if one had chased the price upside and purchased the option when it was trading above the previous day's close.